Regional Command West (RC West) comprises four provinces: Herat, Farah, Badghis and Ghor. The population of RC West is 3,156,000 people.1 RC West borders Iran and is slightly larger than the state of Georgia, with an area of 160,319 square kilometers (61899 sq. miles). The Harirud River flows from the mountains of central Afghanistan, through the provincial capitals of Cheghcharan and Herat, and then along the Afghan-Iranian border. The river has many tributaries, irrigating the areas of agricultural land in the region. However, agricultural production has suffered, as a drought has depleted water levels to historic lows. Disagreements over water rights issues between the western provinces and Iran have also undercut agricultural production. There is a dense concentration of population along these rivers, especially in Herat. Farahrud and Harutrud are two smaller rivers that flow through Farah Province. The Murghab River flows across Badghis Province into Turkmenistan, but a lack of dams and irrigation systems prevents the water from being used for agriculture. Taliban activity spread from the south into Afghanistan’s western provinces in 2005. 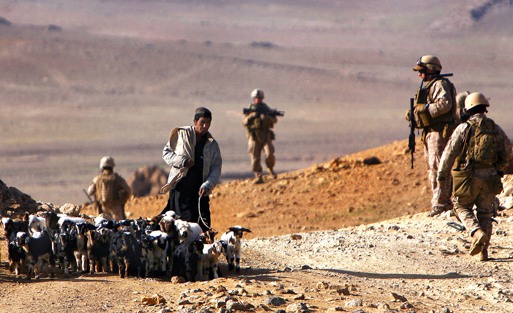 By early 2006, Coalition and Afghan Security Forces battled the Taliban in Herat and Farah provinces. Despite the fact that the RC West is divided between Tajiks, Pashtuns, Hazaras and other ethnic minority groups, there is no systematic violence on ethnic lines. Expulsion of Afghan refugees from Iran into western Afghanistan has also contributed to instability in the region. According to Iran’s Interior Ministry, two million Afghans are living in Iran, more than half of them without legal documents.10 In the last year, 130,000 Afghan refugees have been expelled from Iran to Herat through Islam Qala port.11 Forced repatriation of Afghan refugees from Iran has been a critical issue for the Afghan government. Two Afghan ministers were impeached last years for their failure to convince Iranian authorities to stop deporting Afghan refugees. Because forced repatriation of refugees during the winter months could lead to a humanitarian crisis,12 Iran pledged to halt eviction of Afghan refugees until March 2009.13 A resumption of expelling the refugees could seriously destabilize western Afghanistan. Herat is the richest province in Afghanistan in terms of agriculture and industry. Most of Afghanistan’s trade with Iran passes from Herat through the Islam Qala crossing and into Iran. Herat City is also connected to Kabul, Kandahar, Iran and Turkmenistan through the Ring Road– making Herat the hub for trade in the region. The construction of roads and railways has helped boost trade in western Afghanistan, and connect western provinces to Iran and to northern Afghanistan and Central Asia. A 191-kilometer railway built by Iran connects Khaf of Iran to Herat.14 Iran’s Vice President Pirviz Davoodi announced in Kabul in February 2009 that Iran would also help construct another rail line to connect the province to the Sher Khan crossing along the border with Tajikistan.15 This will be the first railway in Afghanistan linking the west to the northeast. The planned 1,200-kilometer rail line is scheduled to be completed in five years with a budget of $2 billion. The drug trade is a destabilizing factor in the west. In contrast to northern Afghanistan, the RC West is still plagued by opium cultivation. Over 15,000 hectares of poppies were cultivated in Farah in 2008.16 Some 900 hectares of opium were grown in Herat and Badghis in 2008.17 Yet, Ghor was declared poppy-free in 2008 and is projected to remain so this year.18 In addition, the western provinces (particularly Herat) are the primary smuggling route for drugs to Iran and Turkmenistan. More than one-third of Afghan opium is trafficked to Iran through western provinces.19 The flourishing drugs trade has fostered increasing corruption in the government and has stimulated criminality in the region. 1 United States Agency for International Development (USAID), "Afghanistan's Provinces," USAID: Afghanistan. 3 Naval Postgraduate School, “Farah Provincial Profile,” Program for Culture and Conflict Studies. 4 Naval Postgraduate School, “Ghor Provincial Profile,” Program for Culture and Conflict Studies. 5 Naval Postgraduate School, “Herat Provincial Profile,” Program for Culture and Conflict Studies. 6 Naval Postgraduate School, “Badghis Provincial Profile,” Program for Culture and Conflict Studies. 7 Tim Albone, “Iran gives Taliban hi-tech weapons to fight British,” The Times, August 5, 2007; Michael Gordon, U.S. Says Iranian Arms Seized in Afghanstan, The New York Times, April 18, 2007. 8 “Large Weapons Cache Discovered in Western Afghanistan,” Radio Free Europe/Radio Liberty, September 7, 2007. 9 “Large Weapons Cache Discovered in Western Afghanistan,” Radio Free Europe/Radio Liberty, September 7, 2007. 10 “Iran’s Interior Ministry: We have two million illegal refugees,” BBC Persian News, February 13, 2009. 11 “Iran’s Interior Ministry: We have two million illegal refugees,” BBC Persian News, February 13, 2009. 12 “Humanitarian crisis to arise if expulsion of Afghan refugees not halted,” Afghan Paper, January 21, 2009. 13 “Humanitarian crisis to arise if expulsion of Afghan refugees not halted,” Afghan Paper, January 21, 2009. 14 “Road opened in Herat,” Pajhwok News Agency, July 29, 2008. 15 “Railway to Connect Iran to Tajikistan through Afghanistan," Pajhwok News Agency, February 19, 2009. 16 United Nations Office for Drugs and Crime (UNODC), Afghanistan: Opium Winter Rapid Assessment Survey, January, 2009. 19 “Drugs trade from Afghanistan to Iran and Europe,” Hindokush News Agency, December 22, 2008. 20 North Atlantic Treaty Organization, “International Security Assistance Force (ISAF): Facts and Figures,” March 13, 2009. 21 “Italy to send more troops to Afghanistan,” Reuters, February 18, 2009. 22 North Atlantic Treaty Organization Press Release 2009-090, “ISAF senior leaders visit RC-West,” January 28, 2009. 23 North Atlantic Treaty Organization Press Release 2008-527, “New commander takes charge of Herat PRT,” October 12, 2009.